You’ve probably had some days when your guitar playing sounded a lot better than you expected… and I bet you felt very good about yourself on those days, didn’t you? You’ve probably also had days when you played guitar with a lot of mistakes that made you feel bad about your playing (and progress). Sound familiar? You are not alone… every guitar player has had days like that (including myself in the past). It's frustrating to play with mistakes, isn't it? It's even more frustrating when others are watching you make mistakes and you know that you really could play a lot better. ...If only your audience could hear you on one of your good days. Wouldn’t it be great to learn to play guitar at your best every time and eliminate sloppy mistakes that make you sound worse than you really are? Of course it would… and it’s not hard to do. You are about to learn how to do it. 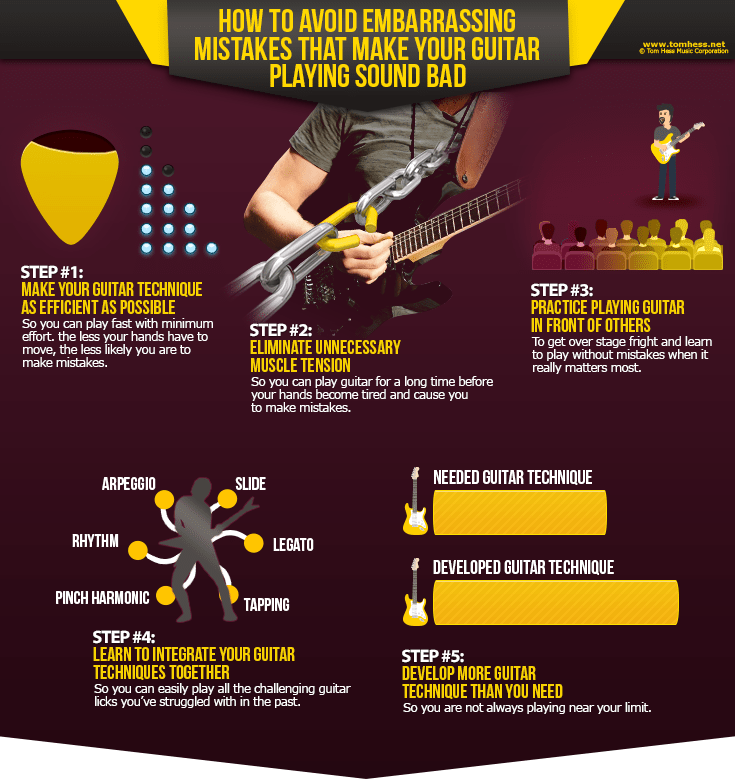 The easiest way to eliminate sloppy mistakes is to improve the way you practice guitar. This makes you better quickly even if you don’t have a lot of time to practice. When your guitar technique is very efficient, your hands don’t move any more than necessary to play the notes you want to hear. This not only helps you reduce sloppy mistakes, but also allows you to play guitar a lot faster with less effort. Keep the pick as close to the strings as possible between notes. Don’t let the pick move away from the strings unless you’re skipping strings. Fret notes using the tips of your fingers. Use a stiff guitar pick. Your guitar pick should be stiff enough to not flex when you push through the string to play a note. (Want to learn a very simple way to make your fretting hand technique very efficient, so that everything you play on guitar feels effortless? Download this free eGuide to learn how to master fretting hand finger independence and make your guitar playing easier than you ever thought possible. The longer you can keep your hands relaxed, the easier it is to keep your hands in sync and play guitar without mistakes. Practice guitar while standing up. Practice guitar with the amp close to you. Practice guitar with the amp far away from you. Practice guitar while walking around. Most importantly, play guitar in front of others every chance you get. Want to know one thing most guitar players want to master but never practice? It is integration. Integration is the ability to seamlessly combine all your skills together in a smooth way, without hesitations, pauses or interruptions. When you master guitar technique integration, many of the guitar playing mistakes you struggle with now will disappear. Think of your ultimate guitar technique goals. Perhaps you want to learn specific songs and guitar solos, or you want to increase your speed to a certain number of notes per minute. Set your goals to play at a slightly higher level than you think you need. Example: learn to play a song at 120 beats per minute on the metronome even if the song’s actual tempo is only 110 beats per minute. When you have more technique (or speed) than you need, you are less likely to make mistakes because you will rarely play near your musical limit. This means you can focus more on having fun and not struggle anymore to play the notes you want to hear. Now that you know how to eliminate mistakes in your guitar playing, would you like to learn a simple guitar practice method that puts it all together and makes your playing cleaner and more accurate right away? Download this free eGuide to learn how to master fretting hand finger independence and start playing guitar effortlessly and consistently without mistakes. Learn how to transform your guitar playing to totally freaking awesome, top-level playing with the best online guitar lessons.